KAMPALA – Justice Lydia Mugambe of the International Crimes Division of the High court on Tuesday, March 19 released on bail eight suspects who are facing charges of murdering former police spoke’s person Andrew Felix Kaweesi, his bodyguard Kenneth Erau and driver Godfrey Wambewa in March 2017. After carefully scrutinising their sureties and finding them substantial enough, Justice Mugambe has ordered each of the eight men to sign a non-court bond of Shs150 million shillings and each of their 3 sureties has been bonded at Shs250m to ensure that the suspects return back to court for trial. Justice Mugambe also explained that even though the accused are charged with grave offenses of Terrorism and Murder, she considers the time they have spent on remand and considering the 2017 ruling of the High Court that ordered government to pay them Shs1,7 billion as money for torture, it would be better for them to heal from out together with their families. However, while granting them bail, the judge also ordered the suspects not to travel outside the country and that they should report every 19th day of the month at any court registrar in their home areas. However, the suspects have returned back to Luzira prison until Friday this week when the state will produce in court their identification documents that were taken from them upon arrest and for their sureties to sign on the release documents. 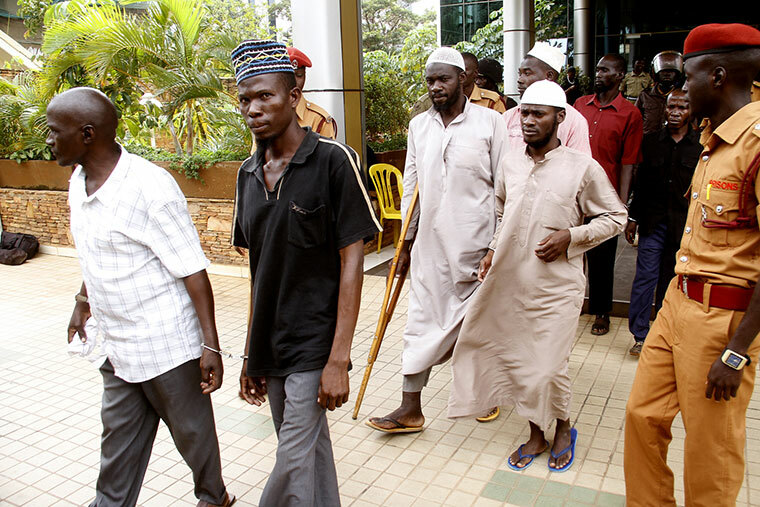 The eight suspects are; Abdurashid Mbaziira, Noordin Higenyi alias taata Abdallazak, Yusuf Mugerwa alias Wilson, Bruhan Balyejusa alias Jimmy Masiga Ogutu, Josshua Magezi Kyambadde alias Abdu Rahman, Jibril Kalyango alias Abu Aisha, Yusuf Siraje Nyanzi alias Jimmy Ssentamu and Shafik Kasujja. Prosecution alleges that the group between January and March 2017 in diverse districts of Kampala, Wakiso, Mukono, Jinja, Iganga, Bugiri, Busia, Tororo and others still at large for purposes of influencing government involved themselves in complicity of murder of Kaweesi. It is further stated that the accused rendered support to Balyejusa and Ogutu who are alleged known members of the Allied Democratic Forces (ADF) rebel group in executing terrorism acts.